About the passion for Vintage Timepieces. For years I have been collecting, when I was a child collecting stamps and coins was one of my favourite hobbies. I remember going to the ‘Waterloopplein’ market in the centre of Amsterdam with my grandmother, it was like going to a toy store for other kids. When I got older I got interested in mechanical objects like; Music instruments, Lighters, steam machines and…. mechanical watches. To be a successful watch collector you need to buy different watches. As a lot of collectors will endorse you need to be a good salesman as well. Unless you have an unlimited amount of cash it’s necessary to sell from your collection to be able to buy new objects. I realized this when I was 16 years old, the age in the Netherlands to drive legally on a 50cc motorbike. With my limited budget I bought an old bike to repair, when the work was done my eye felt on a better example so I sold my repaired bike. Around 10 bikes further I had the coolest bike at school! I started to sell and repair bikes online as a hobby, with the profit I bought even better bikes. I also repaired for peers and friends at school. There was always one brand which fascinated me, Zundapp. These bikes from the 1960’s are real work horses which look very cool, it gave me the feeling driving on a real motorbike (although they where allowed to drive 45km/h and 50cc or 125cc only). What fascinated me was the quality and solidity of these bikes. I found them in unrestored condition driving like new. From that period I believe in Vintage being better then new. These Zundapp bikes are very similar with Rolex, very robust and made to do where they are designed for. Outstanding quality products like this will always be a good investment and it will bring much joy as well. To feed my passion for sales and mechanics I worked in the automotive business for 10 years. In my work I started to know people wearing Rolex watches. My eye felt on the Rolex 5513 Submariner without date from an older colleague, het told me he bought the watch in 1967 for 300,- dollar. When I came home I started to look online for a Rolex 5513 Submariner. It was around 2002 then and I realized the price of the watch had been doubled around ten times in 35 years. How could a watch get higher in price like this? I was totally confused and started reading about vintage Rolex watches online. From the next paycheck I bought a 1971 Rolex 5513 feet first for 2.500,- euro. I still have the watch which is worth around 17.000,- euro’s now (2018). From the next paycheck I bought a Rolex date ref 1505, this watch was not really the piece ment to be for me. I sold the piece within a week to a well known vintage watch dealer in Amsterdam for more money then I paid for it. I realized it was not hard to sell and make a profit on a vintage Rolex watch. My goal then was to start a watch business once. In 2003 I started to collect and buy watches besides my regular job. As I mentioned, a collector needs to sell. I learned to know watch dealers in Amsterdam and other big cities in Europe. I found out selling a vintage watch is more easy these days then changing a 500,- bill in a shop, so I felt more confident spending (all my) money on watches. Since 2016 I quitted my regular job as an automotive salesman to fully focus on watches. I try to offer a variety of vintage watches, there is a vintage watch for any budget in my opinion. The collection is build out of passion and personal interest. I only buy and sell watches I personally like. The mission is to sell high-end vintage timepieces which are a good investment. As a collector I know the need to change watches, for this reason i’m always interested in a trade with your vintage watch. You are also welcome to contact me for any watch related questions or advice buying a vintage timepiece. In my opinion an exclusive watch means a watch which is rare and not easy to find, the price is not what makes a watch rare, a hundred thousand euro watch which can be found at multiple dealers is not rare, a one thousand euro vintage watch with a unique patina in exorbitant condition could be much rarer. 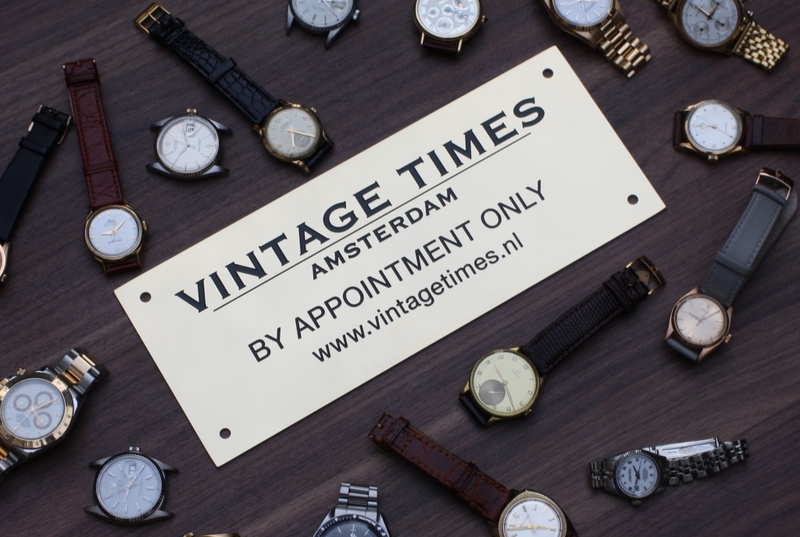 All watches offered at Vintage Times Amsterdam are unique or hard to find because of their condition or rarity! All watches are delivered with 6, 12 or 24 months guarantee on the mechanical parts, depending on service history and manufacture guarantees. All watches have been carefully checked by our watchmakers. Also after the guarantee period we are always willing to help with any issues. Some of our Rolex or Tudor watches have been serviced at the Rolex Service Centre, these watches come with international guarantee. On request we can service any watch we have in stock. Buying a watch online is always exciting. As it needs to be a positive experience we offer our clients the right to return a watch within two weeks when the transaction has been made through chrono24. We are trusted seller at Chrono24 who is offering the option to buy with confidence through their trusted seller checkout service. Please let us know when you want to buy a watch from our website through chrono24 trusted checkout. On request we can arrange a chrono24 trusted checkout for any of our watches. Here you find the link to our chrono24 dealer area. Vintage Times Amsterdam holds an office in the centre of Amsterdam. You can find us at one of the most beautiful canals in the city of Amsterdam. We welcome you at the Herengracht for viewings and watch talk. Please call or mail for an appointment as we work by appointment only.